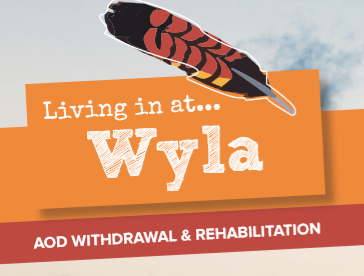 Our Orange-based withdrawal and residential rehab services are now located in a shared space on the Bloomfield Campus, under the new name of Wyla – the Aboriginal name given to the Yellow-tailed Black Cockatoo local to the area. These services (previously known as Lyndon Withdrawal and Wattlegrove) have always worked closely with each other. Being co-located will mean an even smoother transition for those completing withdrawal and then moving into our residential rehabilitation program. We provide live-in withdrawal in a safe and supportive environment which includes educational and group activities. After an average length of stay of seven days, clients can then move into the recovery program for a live -in three-month drug and alcohol program for people aged 18 and over. For more information about Wyla please call us on 1300 596 366.